NVIDIA has today introduced us to the new era of mobile computing that allows for ultra-low power consumption and advanced quad-core processors that produce record breaking performance. The project was originally named "Project Kal-El" but has now been labelled as the Tegra 3. It provides triple the graphics performance of the Tegra 2 and reduces power consumption by up to 61%, something very important in the world of mobile computing. The release has caused quite a stir and Mel Kirk, Vice President of Marketing and Public Relations at Zen Studios said, "With Tegra 3, NVIDIA has shattered the usual constraints on the quality of mobile device experiences. By enabling tablets and smart phones to operate at an exceptional level, it allows developers like Zen Studios to create console-quality experiences that can be enjoyed anywhere, anytime. The quad-core fuelled graphics and physics in Zen Pinball THD are simply incredible and represent the premier mobile pinball experience. You can only get that on devices built on Tegra 3." The Tegra 3 makes use of new technology known as Variable Symmetric Multiprocessing, or vSMP for short. This works to provide much higher performance while requiring very little power and allows the Tegra 3 processor to actually shut down when completing low-level power activities such as listening to music. When it comes to gaming, the Tegra 3 is helping to provide power like never before. 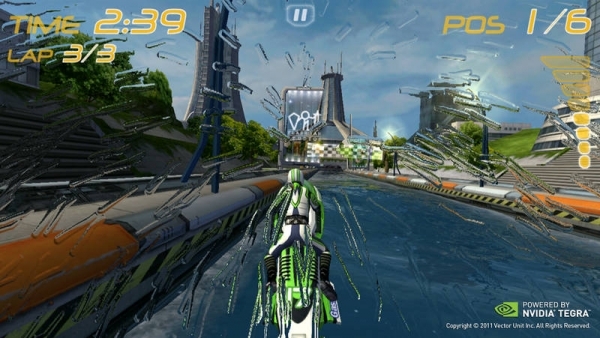 "Tegra 3 is making much more complex gaming environments possible on mobile platforms. Gamers are going to be amazed by the level of graphical detail and realistic physics that come through in quad-core enhanced games like Soulcraft THD." Said Karsten Wysk, CEO of Mobile Bits. The Tegra 3 quad-core CPU's are complimented by a 12 core NVDIA GeForce GPU. This delivers dynamic lighting and physical effects as well as supporting 3D stereo. This means that developers now have a chance to really bring mobile games into a whole new era. An example of just how powerful this may be in the gaming world was made by the CEO and executive Producer at Premium Agency Inc, Katsunori Yamaji, who said, "Tegra 3 is equivalent to a console game machine, and we believe devices with it will play an important part in next-generation games. We've been working on optimizing our cross-platform engine Chidori to fully support Tegra 3. To support Tegra 3's multi-core engine, we've optimized our 3D effect tool. And we've adapted our high-quality shader library, Aoi, to Tegra 3, allowing truly beautiful imagery." The Tegra 3 processor also provides the fastest ever web experience, the fastest ever applications including multimedia apps and photo and video editing and stunningly fast multitasking. "Seamless, compelling Augmented Reality (AR) experiences demand that all of the pieces of a mobile device work together. Metaio's AR software requires optimized mobile hardware to make the way we access digital information a more natural experience. Tegra 3 delivers the multi-core CPU performance required for advanced vision processing while bringing a tremendous boost in GPU performance. Working with Tegra's software stack will make it possible for us to utilise all of those capabilities towards building an Augmented World."